Make Time (2018) promises the seemingly impossible, then actually delivers the goods. 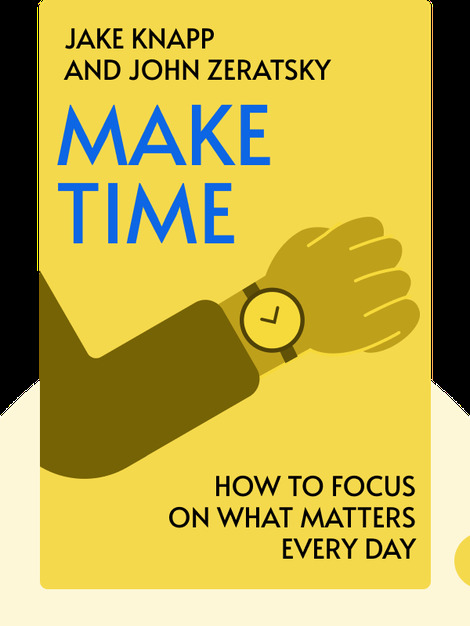 These blinks will help you do exactly what the title suggests: make more time. Of course, there are only so many hours in the day, and you can’t generate more of them. What they do provide, though, is an insightful diagnosis of how and why you lose your time to busyness and distractions along with a highly personalizable strategy and a generous buffet of practical tactics for reclaiming it, allowing you to do the things you really want to do in life. 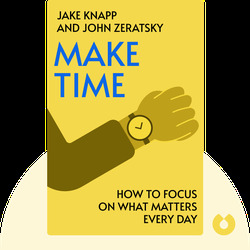 Jake Knapp and John Zeratsky are both former tech industry insiders who used the strategy and tactics outlined in these blinks to regain their time from their hectic lives and pursue their true passions, which ultimately led to major shifts in their careers. John dedicated ten years to Google, where he helped build Gmail and Google Hangouts. Jake spent about 15 years as a designer for tech companies such as YouTube. They met at Google Ventures, where they developed a design process that they shared in their New York Times bestselling book Sprint: How to Solve Big Problems and Test New Ideas in Just Five Days. Now, they’re both professional writers, and John devotes part of his year to his passion for long-distance sailing.